An Egyptian quartet will feature in the finals of the DPD Open Squash as the world’s top four players – Raneem El Welily, Nour El Sherbini, Ali Farag and Mohamed ElShorbagy – get set to do battle for the PSA Gold titles in Eindhoven, Netherlands. World No.1 Raneem El Welily and World No.2 Nour El Sherbini will go head-to-head in the women’s final after they were both pushed all the way to five games by compatriot Nour El Tayeb and France’s Camille Serme, respectively. El Welily avenged her defeat to El Tayeb at February’s PSA World Championships by taking an 11-9, 7-11, 7-11, 11-2, 12-10 thrilling victory, which sees her reach her 47th PSA final. “Nour played really well and maybe better than me in some parts of the match,” said World No.1 El Welily. “I just hung in there and tried to push myself to fight until the end and I live to see another day. El Welily and El Sherbini will contest their 12th successive PSA final after the latter overcame France’s World No.4 Serme in another epic five-game battle in the women’s draw at the DPD Hub in Eindhoven. The two players have faced each other in the previous two tournaments, with both of those encounters also going to five in the favour of the Egyptian, and today proved to be no different as El Sherbini halted a Serme comeback to be victorious by an 11-9, 11-4, 2-11, 3-11, 11-6 scoreline. “It is the third time that I have beaten Camille 3-2,” said 23-year-old El Sherbini. “That shows how hard and tough the match is every time. Unfortunately, we have played the last three tournaments against each other, back to back, but I’m really glad to be on the winning side. The men’s final will also be contested by the World No.1 and World No.2 as Ali Farag and Mohamed ElShorbagy claimed respective semi-final wins over Germany’s World No.4 Simon Rösner and Egypt’s World No.6 Karim Abdel Gawad. Reigning World Champion Farag was in top form to despatch Germany’s Rösner in straight-games in 38 minutes and progress through to his eighth PSA final of the season. “Winning that first game was really important because I know it could have been totally different if I lost that one,” said 26-year-old Farag. “I think my movement got me through today, I don’t think my squash was the best, he was dominating the ‘T’ area for most of the time. Meanwhile, ElShorbagy played out a high-quality match with former World No.1 Gawad to progress through to his second successive final after winning the Grasshopper Cup earlier this month. The two players brought the crowd to their feet with an emphatic display with ElShorbagy taking an 11-9, 7-11, 11-8, 11-9 victory that will see him face Farag tomorrow in their first meeting since 26-year-old Farag took the World No.1 spot from him. “He’s [Gawad] definitely the most talented squash player we have on tour now,” said 28-year-old ElShorbagy. “You have to get the physicality into the match and make him work hard. The players who like making squash look easy don’t like playing players that make it look tough. The finals will take place on Sunday April 14 at 15:00 local time (UTC+2) and the action will be broadcast live on SQUASHTV (rest of world) and Eurosport Player (Europe only). Egypt’s World No.1 Raneem El Welily narrowly avoided defeat in the quarter-finals of the DPD Open Squash as she claimed a 3-2 win over United States World No.12 Amanda Sobhy in Eindhoven, Netherlands. 30-year-old El Welily was pushed all the way in a tense battle with Sobhy as she secured a 7-11, 11-7, 11-7, 4-11, 11-8 triumph against the American in a thrilling match to reach the last four of the PSA World Tour Gold tournament. “I’ve been waiting for the day to play Amanda since she came back from injury,” said El Welily following her victory. “She played so well and was so sharp today to push me to my limit. At 8-8 in the fifth I was hanging in and I was afraid she was going to fire something into the nick like she did in previous points but I’m very happy that I managed to stay in those rallies. El Welily will now face compatriot and World No.3 Nour El Tayeb in a repeat of their PSA World Championship semi-final, where El Tayeb prevailed. World No.3 El Tayeb was in scintillating form to despatch English No.1 Sarah-Jane Perry in just 22 minutes in the first match of the day’s play, including an 11-0 win in the third. “SJ is one of the toughest on tour,” said 25-year-old El Tayeb. “We have had so many battles and I’m sure she is still coming back from her elbow injury and it’s not going to be the same again. Meanwhile, France’s Camille Serme and Egypt’s reigning World Champion Nour El Sherbini will clash at the third successive tournament after they claimed respective wins over England’s Laura Massaro and Wales’ Tesni Evans. The last two times the two players have met it has gone to five-games in the favour of El Sherbini and Serme will be hoping for a different outcome tomorrow after she overcame former World No.1 Massaro in a four-game battle. “I’ve kind of looked up to Laura as a mentor since the beginning,” said the Frenchwoman following her win. El Sherbini meanwhile showed that she was at her best as she displayed a formidable performance to despatch Welshwoman Evans in straight-games. In the men’s draw, Egypt’s World No.2 Mohamed ElShorbagy overcame younger brother, Marwan, to book his place in the semi-finals where he will take on former World No.1 Karim Abdel Gawad. The Egyptian brothers were meeting for the first time since they clashed at the 2018 El Gouna International, which went in the favour of Marwan. However, it was the older sibling who came out on top this time around with a strong 11-9, 11-8, 11-6 victory. “I had to [be sharp]. When he plays me, or Ali [Farag], or Tarek [Momen], or any of these top guys, he can turn his engine on at any time,” Mohamed said of his younger brother. “He was once playing at a very high standard. You don’t just lose that all of a sudden, and he can turn it on at any time. I had to be very sharp from the first point, I had to be aggressive. Meanwhile, his semi-final opponent, Gawad, overcame New Zealand’s World No.5 Paul Coll in a tight battle with the Kiwi saving six match balls before the Egyptian was eventually able to close out a 7-11, 11-7, 11-6, 14-12 win in 75 minutes. The other men’s semi-final will see Egypt’s World No.1 Ali Farag face Germany’s Simon Rösner for a place in the final. Farag ensured he followed in his wife’s, Nour El Tayeb’s, winning footsteps as he got the better of 2018 British Open champion Miguel Rodriguez over four-games to edge out the Colombian and advance to the last four. He will go up against Rösner in the next round, who displayed a masterclass of a performance to send out England’s No.1 Declan James in straight-games. The semi-finals will take place on Saturday April 13 at 15:00 local time (UTC+2) and the action will be broadcast live on SQUASHTV (rest of world) and Eurosport Player (Europe only). The third day of action at the DPD Squash Open, PSA Gold event saw all eight matches go the way of the higher-ranked player, with World No.2 Mohamed ElShorbagy setting up a quarter-final clash with younger brother, Marwan, in Eindhoven, Netherlands. The Egyptian brothers will face each other for the first time since last season’s El Gouna International, where Marwan got the better of his older brother in the semi-finals before going on to win his first PSA Platinum title at the event. Former World No.1 Mohamed kickstarted his DPD Open Squash campaign with a confident 11-5, 11-8, 11-7 victory over World No.36 Chris Simpson in the second round of the event. “He played really well,” said 28-year-old Mohamed ElShorbagy following his victory. “He played really accurate, mixing the pace well and put me under pressure at times. Meanwhile, Marwan was forced to hold off a resilient Joel Makin as he overcame the Welsh World No.15 by an 11-4, 9-11, 11-6, 8-11, 11-8 margin in a gruelling 83-minute battle to secure a place in the last eight. “Joel has been playing at a top ten level,” said 25-year-old Marwan. “He has beaten the World No.1, he has beaten a few players inside the top ten so I knew that this match was probably going to be the toughest first round match I could have got. In the other men’s quarter-final, New Zealand’s Paul Coll will go head-to-head with Egypt’s former World No.1 Karim Abdel Gawad after they secured respective wins over Germany’s Raphael Kandra and France’s Gregoire Marche on day three. Egypt’s World No.6 Gawad held off a late charge from dynamic Frenchman Marche to reach the last eight in five-games, while Coll displayed a confident performance to down Kandra in straight-games. In the women’s draw, Wales’ World No.9 Tesni Evans stands in World No.2 Nour El Sherbini’s way in the next round after the reigning World Champion got the better of Malaysian icon Nicol David in straight-games in a dominant performance at the DPD Hub in Eindhoven. “It’s really hard to play Nicol when you know it is the last season for her,” said 23-year-old El Sherbini following her win. “I always say it’s really special to play against Nicol. Evans, meanwhile, was pushed all the way to five in a tense battle with Egypt’s Mariam Metwally. The two players faced each other just last month at the Black Ball Squash Open with that match also going all the way to five, as Evans used her mental edge to close out the victory. “That was a really big match for me in many ways,” said Welshwoman Evans. “I’m really happy that I dug in and showed some grit and determination, which I think in the end that is what it came down to. Former World No.1 Laura Massaro narrowly avoided defeat against Canada’s Hollie Naughton after the Englishwoman found herself staring down the barrel of defeat at 2-0 down. Massaro was forced to call upon all of her resilience to find a way back against surprise package Naughton, who played some of her best squash in the opening two games, however Massaro clawed her way back to win 8-11, 8-11, 11-8, 11-8, 11-7 in 49 minutes. She will now face France’ World No.4 Camille Serme in the quarter-finals after the Frenchwoman defeated Egypt’s Yathreb Adel in four games in the first match of the day. “I knew that I’ve got a good reputation for being a fighter,” said former World No.1 Massaro. “I thought that if I’m going to go down then go down fighting and luckily it was enough in the end. The quarter-finals will take place on Friday April 12 at 12:00 local time (UTC+2) and the action will be broadcast live on SQUASHTV (rest of world), Eurosport Player (Europe only) and the official Facebook page of the PSA World Tour (excluding Europe and Japan). England’s World No.17 Declan James delivered a huge upset to reach the quarter-finals of the DPD Open Squash after he knocked out Egypt’s World No.8 Mohamed Abouelghar on day two of the PSA World Tour Gold tournament in Eindhoven. The England No.1 produced one of the biggest performances of his career to down Egypt’s Abouelghar in straight-games in just his second win over a top ten player after defeating Egypt’s Marwan ElShorbagy last month at the Citigold Wealth Management Canary Wharf Classic. Nottingham-born James looked down and out in the opening stages of the first game as Abouelghar took complete control with his artillery of shots to take a 10-5 lead. However, the tall Englishman soon grew into the game, capitalising on any loose shots that came from the racket of the Egyptian to take the first game on the tie-break. The Englishman then doubled his lead, with Abouelghar allowing errors to affect his game, before the World No.17 was able to close out a 14-12, 12-10, 11-6 victory. “I knew that I was playing well coming into this event,” said 25-year-old James. “Me and my coach went back after Grasshopper and worked on a couple of things and it seems to have made a difference quickly which I’m really happy about. James will now face Germany’s Simon Rösner for a place in the semi-finals, after he defeated talented Egyptian Mazen Hesham in straight-games. The German didn’t put a foot wrong in the opening two games as he put Hesham, who defeated France’s Mathieu Castagnet yesterday, to the sword to take an early advantage. The Egyptian came back in the third, but it proved to be in vain as Rösner closed out on the tie-break. “He is such a unique player,” said the 31-year-old German. “You don’t know what you are going to get so you can’t prepare really. Even though I was 2-0 up, I knew that he could come back at any time, so I just tried to be on my toes, and I think it was good for my confidence today. The other quarter-final match up will see World No.1 Ali Farag take on Colombia’s World No.7 Miguel Rodriguez after the Egyptian conquered England’s former World No.1 James Willstrop in straight-games to advance. “I’m happy I got the win today,” said reigning World Champion Farag. “He came at me in the first and I guess he is more used to the court, but I’m glad I got that one in my favour because the mentality would have been different otherwise. Farag will face Rodriguez in the next round after he overcame skilful Englishman Daryl Selby in four-games. Selby overturned multiple gameballs to take the opener, before Rodriguez found his best shots over the course of the next three games to take the match, with some exhibition style rallies between the pair impressing the crowd. "I really liked it and I'm happy with my performance,” said the Colombian afterwards. “In the first game, he played unbelievably well. He was patient, he was getting everything, and I had to come back stronger in the second. Meanwhile, in the women’s draw, World No.1 Raneem El Welily scrapped through to the quarter-finals after a five-game battle with England’s World No.22 Millie Tomlinson. The two players had never met before on the PSA Tour, but the 26-year-old Englishwoman pushed the World No.1 all the way as El Welily was forced to call upon her big match experience to dig her out of trouble to claim a narrow 11-9, 8-11, 11-8, 8-11, 11-5 victory. “She was really attacking,” said the 30-year-old Egyptian after the match. “Everything was going her way and in the nick all the time. It was a very tough match for my first round here but I’m happy to be through and survive the storm. El Welily will now face United States No.1 Amanda Sobhy for a place in the semi-finals after she displayed a dominant performance to down England’s former World No.3 Alison Waters in straight-games. Meanwhile the other quarter-final match in the top half of the draw will see England’s Sarah-Jane Perry battle against Egypt’s World No.3 Nour El Tayeb. Perry avenged her defeat from a week ago at the Texas Open against former World No.1 Rachael Grinham in Eindhoven as she claimed a 3-1 victory, while El Tayeb was clinical to dispatch Belgium’s Nele Gilis in straight-games in the Dutch city. “I was very prepared,” said 25-year-old El Tayeb following her win. “I knew that she could run and pick up everything, so I had to be ready for that. Mentally I was prepared for a hard match and I think I played very well and I’m very happy with my performance. in round one in Eindhoven, Netherlands. World No.31 van der Heijden was unable to deliver in front of her home crowd on day one of the PSA World Tour Gold tournament as she succumbed to a 3-1 defeat at the hands of World No.22 Tomlinson inside the setting of the brand new DPD headquarters in Eindhoven. The Englishwoman started strongly and never let up to take the first two-games. A good spell from van der Heijden in the third saw the Dutch player rattle off a flurry of points to pull a game back, however, it was not enough to prevent Tomlinson from booking her place in the second round, where she will now face Egypt’s World No.1 Raneem El Welily. “I’m relieved,” said 26-year-old Tomlinson following her victory. “Milou had a good win against me in San Francisco a few months ago, so it was good to come out here and get my revenge. Van der Heijden’s compatriot in the women’s draw Tessa ter Sluis was also unable to make it a day to remember for the home crowd as she was defeated in straight-games by Egypt’s Yathreb Adel, who will now face France’s World No.4 Camille Serme in the next round. Meanwhile there was joy for eight-time World Champion Nicol David, who resides in Amsterdam, after she overcame Egypt’s World Junior Champion Rowan Elaraby in four games to set up a mouthwatering second-round tie against reigning World Champion Nour El Sherbini. Elsewhere in the women’s draw, former World No.1 Rachael Grinham rolled back the years as she prevailed against America’s Olivia Blatchford Clyne in a five-game thriller on the sidecourts at Squash Time in Eindhoven. The 42-year-old took a two-game lead, before Blatchford Clyne battled back to draw level. However, it was the Australian who was able to close out the victory to complete an 11-8, 11-9, 7-11, 8-11, 11-6 win in 45 minutes and will now face England’s No.1 Sarah-Jane Perry in the next round. “Nowadays, I just try to enjoy my squash as much as I can, because the more I’m relaxed, the more I play well,” said former World Champion Grinham. She will be joined in the second round by Canada’s Hollie Naughton after she upset higher seeded opponent Emily Whitlock to advance at the tournament. The Canadian enjoyed a five-game battle with the Englishwoman to secure a second-round berth where she will face England’s former World No.1 Laura Massaro. In the men’s draw, Wales’ Joel Makin ended Dutch hopes as he put wildcard Roshan Bharos to the sword in straight-games. The Welshman was comfortable on court to dispatch the Dutch hopeful by an 11-3, 11-4, 11-5 scoreline and will now face Egypt’s Marwan ElShorbagy for a place in the quarter-finals. "Me and Roshan played a bit of juniors together,” said the 24-year-old Welshman. "I know Roshan because he trains in Bristol, which isn't too far away from me. I know he's working hard there and trying to improve his game. Meanwhile, England’s former World No.1 James Willstrop battled back from the brink of defeat against Australia’s Cameron Pilley to book his place in the second round. The experienced duo had faced each other seven times in the past on the PSA Tour, with Willstrop claiming all of those wins, however, it looked as though Pilley was finally going to break that run when he went 2-1 up. Willstrop dug in deep though and showed his resilience to produce a masterclass in the fifth game and take a 6-11, 11-7, 8-11, 11-9, 11-5 victory. Willstrop will now face World No.1 and reigning World Champion Ali Farag in the next round. “It was very hard against Cameron,” said the Commonwealth Games Gold medallist. “I never know where he is going to put the ball, there is so much hold and deception. He’s really hard to play against and we have been playing each other for years. Willstrop’s compatriot Declan James also enjoyed a strong performance in round one, overcoming Egyptian World Junior Champion Mostafa Asal in a comfortable straight-games victory. The tall Englishman played with maturity to avenge his defeat to the teenager at December’s Black Ball Open and will now face Egypt’s Mohamed Abouelghar for a place in the quarter-finals. “I tried to leave emotions out of it,” said James following his victory. “I had a very professional attitude and I’m happy with the level of squash I played. He will be joined by Daryl Selby in round two after he overcame France’s Lucas Serme in a gruelling 80-minute encounter, while George Parker was unable to make it a clean sweep for the English after he fell to defeat at the hands of Germany’s Raphael Kandra. Meanwhile, Egypt’s Mazen Hesham also claimed an important victory, overcaming experienced Frenchman Mathieu Castagnet, to set up a second-round clash against Germany’s World No.5 Simon Rösner. The talented Egyptian dominated on court in the opening exchanges against Castagnet to take a 2-0 lead, before the Frenchman began to battle back in the third to reduce the deficit. However, Hesham was able to remain mentally strong to close out the victory by an 11-8, 11-7, 4-11, 11-8 scoreline. “I think playing Castagnet you can never give him an inch to get back into the match because he will just keep on fighting and fighting,” said the Egyptian following his round one win. The second round takes place on Wednesday April 10 at 12:00 local time (UTC+2) and the action will be broadcast live on SQUASHTV (rest of world), Eurosport Player (Europe only) and the official Facebook page of the PSA World Tour (excluding Europe and Japan). Netherlands’ World No.31 Milou van der Heijden will be one of the home favourites in action when the DPD Open Squash takes place in Eindhoven from April 9-14. The PSA World Tour Gold tournament will host 48 of the best male and female players when they descend on the Dutch city next month to battle it out for the titles. The tournament will be held at the new DPD headquarters in Eindhoven to mark the grand opening of their new distribution centre and will feature a total prize fund of $212,000 split equally between the men’s and women’s draws. Home hope van der Heijden can’t wait to see squash come back to the Netherlands. “I’m very pleased,” said Dutch No.1 van der Heijden. “Obviously for me to play in the event, but also for the Dutch squash fans it is very exciting to have such strong draws in both events. I think it’s going to be a great week. The last time a major squash tournament was held in the Netherlands was the 2011 PSA World Championships in Rotterdam and 28-year-old van der Heijden – who resides in Eindhoven - is looking forward to performing in front of her home crowd once again. “The last time I played a PSA tournament in the Netherlands was qualification of the World Championships in Rotterdam back in 2011, so that is a long time ago. I think this will be completely different, as I now get to play on the glass court in such a great venue. Van der Heijden recently captured her biggest PSA title to date after she defeated France’s Coline Aumard in the final of the Annecy Rose Open and she says she is hoping to carry that winning momentum into next week’s tournament. The Dutch player will begin her tournament against England’s World No.22 Millie Tomlinson in round one, with van der Heijden getting the better of her English opponent earlier this season at the Oracle NetSuite Open in San Francisco. “Me and Millie have been playing each other since juniors. We’ve had some battles, so, this time will be no different. Van der Heijden will be joined in the draw by women's wildcard Tessa ter Sluis and Roshan Bharos, who takes the wildcard spot in the men's event. Opening round matches of the DPD Open will be played on Tuesday April 9 at a purposely built squash arena at the DPD premises and at Squashtime, a 15-court facility in Eindhoven, which is the home of Dutch National Champion van der Heijden. From April 10-14 all matches will be played on the glass court. The draws for the 2019 DPD Open Squash have been announced today, with some blockbuster fixtures in store at the DPD Hub Eindhoven between April 9-14. 48 of the best male and female players will descend on the Dutch city next month to battle it out for the PSA World Tour Gold titles. World No.1 and World Champion Ali Farag is seeded to meet compatriot and World No.2 Mohamed ElShorbagy in the final. The two players have become familiar foes on the PSA World Tour this season, battling it out in three finals already in 2018/19. Farag will first have to negotiate through a tough field, which sees him drawn on the same side as the likes of Colombia’s 2018 British Open champion Miguel Rodriguez, compatriot Mohamed Abouelghar and Germany’s World No.5 Simon Rösner, who he could face in the last four. ElShorbagy meanwhile, could face a showdown with compatriot and former World No.1 Karim Abdel Gawad for a place in the final. Also seeded in the bottom half of the draw is New Zealand’s Paul Coll, who recently won the Canary Wharf Squash Classic title and ElShorbagy’s younger brother, Marwan. Meanwhile in the women’s draw, World No.1 Raneem El Welily and World Champion Nour El Sherbini could lock horns in the final of the DPD Open, in their fourth meeting in a final this season. 2019 Black Ball Open winner, El Welily could face compatriot and World No.3 Nour El Tayeb in the semi-finals of the tournament. The last time the two players came up against each other was in the last four of the PSA World Championships in Chicago when El Tayeb put an end to El Welily’s title defence. Also situated in the top half of the draw is New Zealand’s World No.5 Joelle King and England’s World No.6 Sarah-Jane Perry. El Sherbini, meanwhile, could face a rematch with France’s World No.4 Camille Serme in the semi-finals in Eindhoven. The two players have faced each other in their last two tournaments with both matches going to five-games and seeing the Egyptian triumph. Also in the bottom half of the draw is England’s former World No.1 Laura Massaro and Egypt’s World No.8 Nouran Gohar. Home interest in the women’s draw comes in the form of Netherlands’ Milou van der Heijden and wildcard Tessa ter Sluis who will face England’s Millie Tomlinson and Egypt’s Yathreb Adel, respectively, in round one. The men’s wildcard will be decided on March 31 in a Play-Off match between Roshan Bharos and Thijs Roukens. The winner of that match takes on Joel Makin from Wales in the opening round. The world’s greatest squash players – including reigning World Champions Ali Farag and Nour El Sherbini (right) – will line up in Eindhoven between April 9-14 as they do battle for the 2019 DPD Open, PSA World Tour Gold titles. Held at the new DPD Hub in Oirschot, the DPD Open will offer up a prize purse of $212,000, which is split equally between the men’s and women’s events. 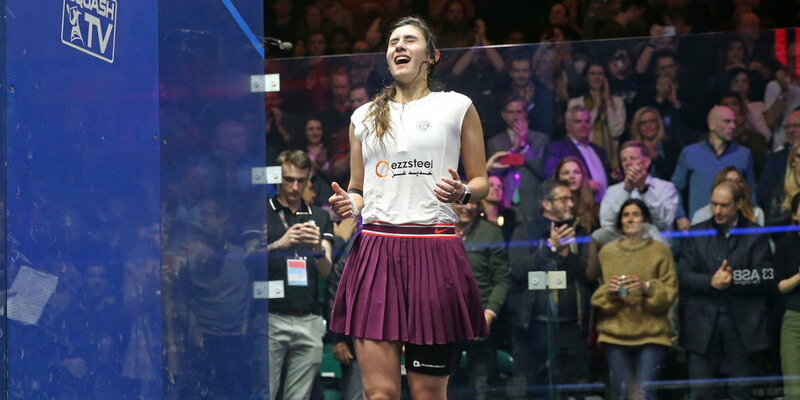 Farag and El Sherbini will look to replicate the form which saw them claim the most prestigious titles in squash last week at the PSA World Championships presented by the Walter Family. Farag dethroned fellow Egyptian Mohamed ElShorbagy to rise to World No.1 earlier this month, and both players will feature in a top-class draw that also features stars such as former World Champion Karim Abdel Gawad, Germany’s Simon Rösner, Colombia’s Miguel Rodriguez, Netherlands-based Paul Coll, World No.8 Mohamed Abouelghar and former World No.3 Marwan ElShorbagy. The women’s draw will feature the entirety of the top 10, with World No.1 Raneem El Welily headlining the draw ahead of El Sherbini, World Championship runner-up Nour El Tayeb, France’s Camille Serme, New Zealand’s Joelle King, English duo Sarah-Jane Perry and Laura Massaro, and World No.8 Nouran Gohar. Also included is Dutch No.1 Milou van der Heijden. Eindhoven-based van der Heijden currently holds a career-high World No.29 ranking and will head up home interest. Dutch No.2 Tessa ter Sluis has been named the wildcard in the women’s event, while the men’s wildcard will be decided by a playoff between the top ranked Dutch male, Roshan Bharos, and World No.265 Thijs Roukens, prior to the tournament starting. Matches will be split between the DPD Hub and Squash Time Eindhoven during round one, while all matches from the second round onwards will be held on the glass court erected at the DPD Hub.